As I learn more and more about wheat, especially modern wheat, my family and I have decided to cut back on our consumption. Not eliminate it, but maybe eat less of it than before. But I’m also not interested in jumping on the “gluten-free” bread bandwagon and upping my intake of almond flour, brown rice flour or other wheat substitutes that usually come with their own set of dietary issues. So, while we have decided to reduce our wheat exposure, I didn’t say that we were going to give up on all bready items, such as muffins, pancakes, waffles or biscuits. So now I have a challenge… find a recipe that is somewhat bread like, but without the downside that comes with grains and gluten. 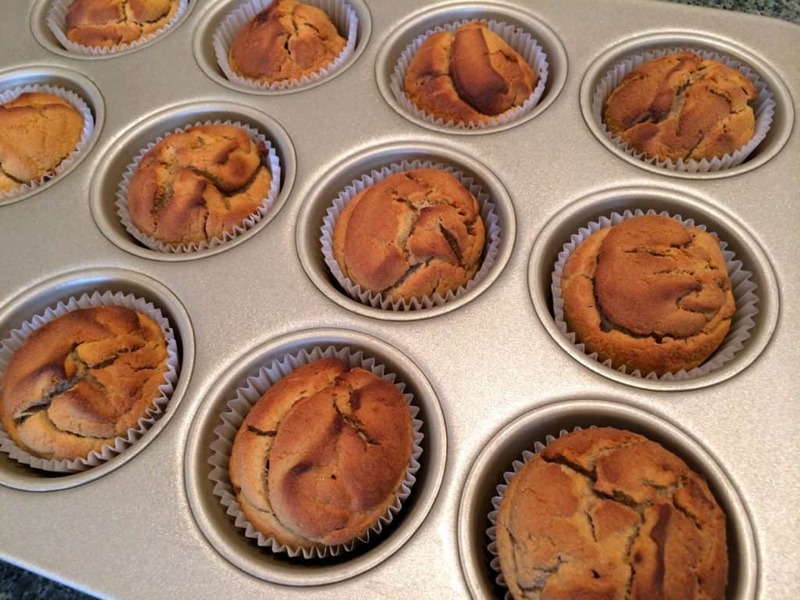 Something like coconut flour banana muffins. And just for fun, because I am crazy, why not give it a try in my Vitamix? To be clear, I am not trying to go completely grain free, though there are certainly many famous experts who insist we should. At this point in my dietary evolution, I am simply trying to eat fewer grains in general, and really trying hard to avoid any modern wheat. So why a grain free muffin recipe? Why even bother with coconut flour banana muffins? Why not stick with one of a million awesome banana bread recipes out there that use regular flour? Even though I am not ready to totally give up on grains, I have read enough now to fully subscribe to the merits of reducing our exposure to wheat, especially modern wheat. The product we call wheat today is dwarf wheat, which is very different from the wheat grown in the first half of the 20th century. Dwarf wheat has been developed to increase productivity and yield, with no regard to nutrition or digestive ramifications. As a result, today’s wheat, which some critics call “Frankenwheat”, is a much shorter plant, easier to grow, with a much higher gluten yield and far more profitable for agribusiness. If you have read other posts on this site, then you know I am ok with some bread, especially if using a sprouted heirloom variety. 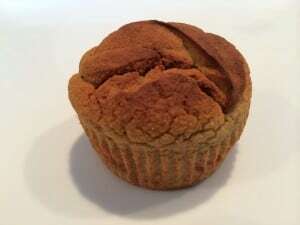 But for today, I am skipping grains, and instead choosing to use coconut flour as the backbone of these banana muffins. Coconut flour has a few benefits when used in recipes that simply can’t be found with wheat. But it also can be a bit more challenging as well. Coconut flour is super absorbent, and you will need to use much less of it than other flours. Don’t even think of trying to swap it out equal parts with wheat flour, it won’t work. Because coconut flour is so absorbent, you need to make sure to use plenty of wet ingredients to keep the batter together and cohesive. Eggs are typically used with coconut flour, sometimes in excess, in my opinion. Trying to ensure that this banana bread doesn’t end up tasting more of egg than banana, this recipe calls for only 4 eggs, which really isn’t too bad compared to other recipes I’ve seen. Of course, at this point, the only eggs in my house are from pastured raised chickens. Not only are they prettier, but they are better for you as well! All of the other ingredients in this recipe, and there aren’t very many, are pretty standard. When choosing bananas, I try to find organic is possible, but if not, I won’t pass up the chance to make banana bread just because all I could find were conventional bananas. Also, I know that many people won’t even think of baking with bananas unless they are dark brown and nearly rotten. I don’t let that slow me down at all. If my bananas are still bright yellow, I simply stick them in my oven while preheating and by the time I need them, they will have browned up a bit, and the muffins will still be superb, and no one will know the difference! Applesauce was the last item that I wanted to think about before throwing in the recipe. But it turns out that there really isn’t much to think about with applesauce. I always use unsweetened applesauce, for the same reason I use unsalted butter, I don’t want other people in control of my ingredients. If I want to add sugar, or salt, I’m capable of doing that on my own, and don’t need to buy it already added. Speaking of which, I chose not to add any sugar on top of the natural sugars found in the fruits. But if you wanted to, you could certainly add a little honey to these coconut flour banana muffins, and I’m sure they would be great! Oh, did I mention that these muffins have about 55 calories each?! Awesome. 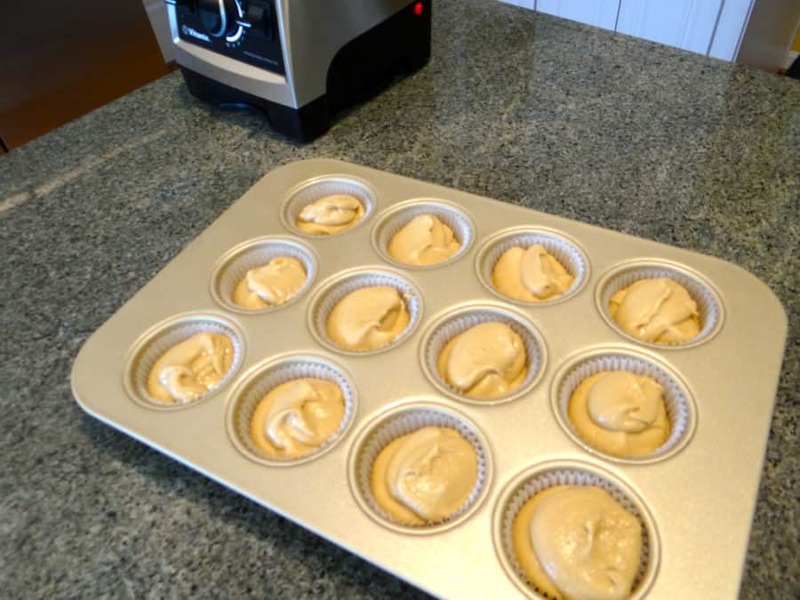 That doesn’t mean you get to put a whole batch away each day, but it sure is less caloric than most other muffin recipes you are going to find. We enjoyed these yummy muffins this morning! I really appreciate your blog, Greg, on many levels- as a mom who insists my family make thoughtful food choices; as a person who is intolerant of gluten; and as a person who knows the importance of thoughtful food choices when managing an autoimmune disease. Keep it coming! Lori Beth, thanks so much for leaving a comment, and such a nice one! I’ve been amazed to hear just how many people are affected by food issues and autoimmune diseases, it’s really been an eye opener. If this blog helps out at all, then I am a happy guy! I am just curious about the fat content, please. 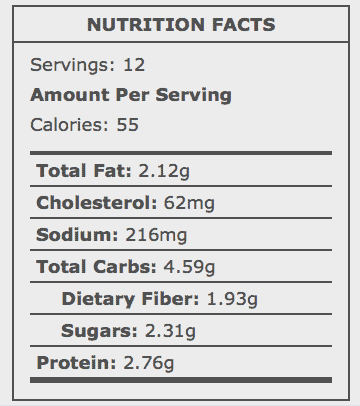 If the recipe calls for 4 eggs (20g of fat) then how can each muffin only have .7g of fat. 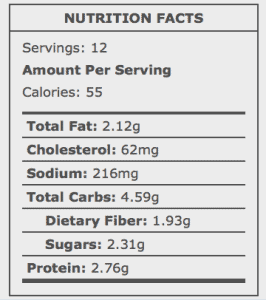 Even if the eggs are the only source of fat in the recipe each muffin should have 1.66g of fat.